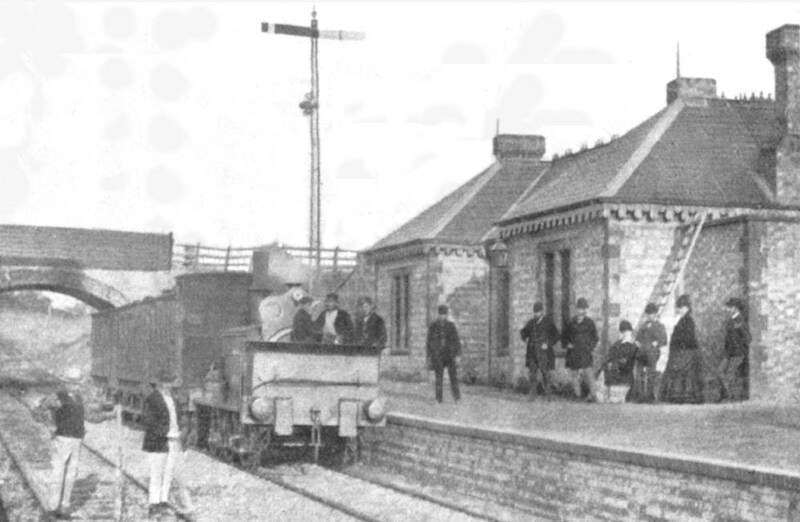 The arrival at Kineton of the first ever East West Railway train from Blisworth where the train temporarily terminated until the Kineton to Stratford section was completed two years and one month later on 1st July 1873. The 0-6-0T is thought to be the contractors locomotive evidenced by the pair of buffers, used for East & West Railway's rolling stock and inside these the two wooden or dumb buffers used by the rolling stock used in the line's construction. The signal is of interest too being a hand operated bidirectional signal. The early years of railways saw railway policemen control the departure of traffic through the use of flags which then gave way to mechanical signals such as that seen above. Signal boxes controlling sections (blocks in railway parlance) started to arrive on the railways not long after the E&WR was opened.